With programmes designed and operated by our partner company, Varsity International Summer Schools, the role of TEFL instructor is to deliver English lessons to children in ability classes of up to 12 students on one of our day Camp locations. You will be required to assist in the preparation of these lessons, although all resources will be provided. The main aim of the English programme is to achieve full integration between international and British children, who will also be attending Camp. In between lessons you will be part of the great Ultimate Activity Camps instructor team, helping to deliver activities and supporting international children within their groups. Experience with young learners (4 – 14 years) is preferable for this role. CELTA/TESOL qualified or PGCE (Primary, English or MFL) or equivalent. Experience in teaching English to foreign students, preferably of primary school age (4-11). Experience of teaching EFL to children of different nationalities, ability and age. Experience of holiday summer schools or activity camps desirable. Flexible, team player, able to adapt to dynamic situations and challenges on Camp. Deliver engaging English lessons for classes of up to 12 children in ability level groups frombeginner to advanced. Support other staff on Camp to integrate children into the activity programme. Ensure all policies and procedures on camp are adhered to by yourself and the children inyour care, including health and safety, and safeguarding procedures. Take a pastoral role welcoming new children into your group and liaising with the CampManager, Academic Manager and/or parents as necessary. Monitor student progress and provide written feedback to parents in report form at the end ofeach student’s time on Camp. At all times behave in a manner that reflects the expectations of Ultimate Activity Camps. 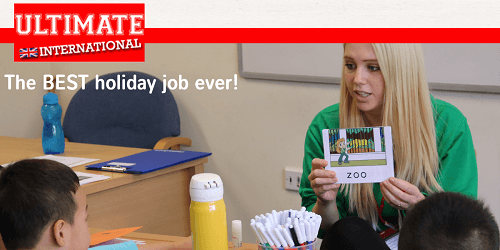 Live up to the Ultimate Activity Camp promise of ‘Inspiring Children Every Day’ throughout youremployment. Show the required energy, enthusiasm and professionalism for the duration of the season, actingas an ambassador for Ultimate Activity Camps and behaving as a suitable role model for children. Other ad-hoc duties (cleaning, equipment maintenance/ordering etc). Contract: Seasonal work available in Easter and Summer school holidays. Hours: 8.30am – 5.30pm week days. Salary: £386.25 - £430 per week plus holiday pay.